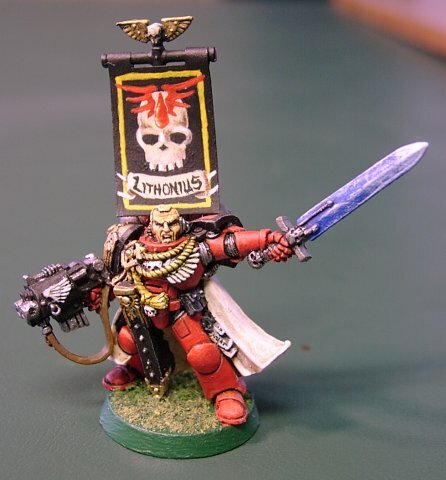 Pete's Place: What is 40k? I decided it might be best to describe what the game is all about in a question-and-answer format, since I often get these questions from new players or just passers-by. Do you take turns going, or what? What makes one piece more powerful than another? 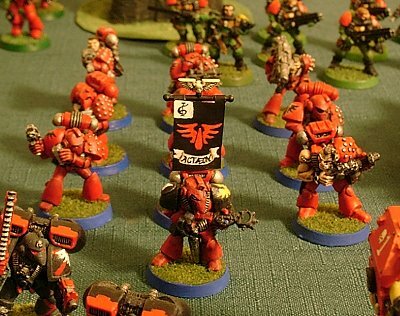 Over the years, Warhammer 40000 has evolved from a game that was governed by a rulebook (or stack of them) to a complete game that came in a box; now it seems to have gone back to its earliest origins. For beginners, Games Workshop does still offer a boxed set, the "Battle For Macragge", which includes a basic rulebook, several plastic Imperial Space Marines (the "Good Guys"), a whole horde of plastic Tyranids (the "Bad Guys"), and a model of a crashed space ship to fight over. To participate in what we would call a "real" game, you'd need a little more. There is a full-on rulebook available, filled with every possible detail you'd need to know about playing the game, collecting the models and painting them. Plus, each army is described by a "Codex," which has the "advanced" rules that set armies apart from one another, and are less generalized than the basic rules found in the Battle for Macragge box; and, unless you want to fight the same battle against the "bugs" over and over again, you'll you'll probably want more varied miniatures than the ones that come in the boxed set. The "board" generally consists of a (sometimes felt-covered) table measuring six feet long and four feet across. The players populate the board with random assortment of scale model terrain such as ruined buildings, bunkers, alien plant life, rocks, and such. This simulates one of the many nameless bettlefields of the 41st millennium. The players then determine their battle lines by specifying a Deployment Zone. Depending on the kind of mission the players are involved in, the deployment zones may be opposite sides, opposite corners, or the middle for the defender and the edges for the attacker. In this game, for example, my Space Marines found themselves deployed in the middle of the board, surrounded on either end by the planetary defense forces loyal to a governor who had forsworn his oath to The Emperor. 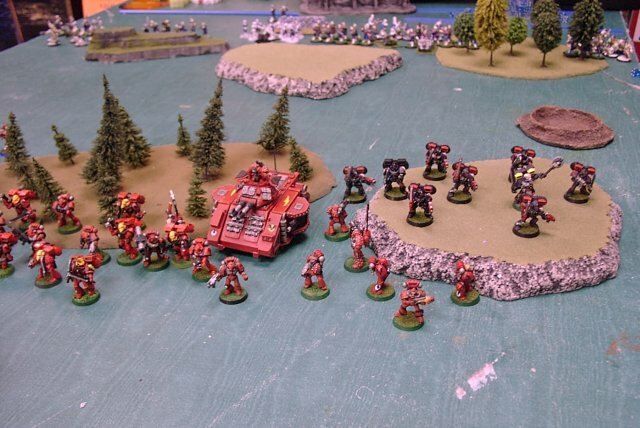 The marines blasted their way off one edge of the board to victory, which was the objective of that particular game. Before the game begins, both players agree on a "Mission." This can be decided by consensus, or rolled for randomly on a table provided in the rulebook. The objective of the game is then dictated by the kind of mission the players are on. A simple battle, for example, may specify that each side scores points for eliminating enemy forces, and that the player with the most points at the end is the victor; whereas a more complicated mission may involve the rescue of comrades who have been cut off by the enemy or a sabotage raid on a fortified position. Each player owns a collection of miniatures, each of which represents a particular type of soldier, vehicle, weapon, etc. 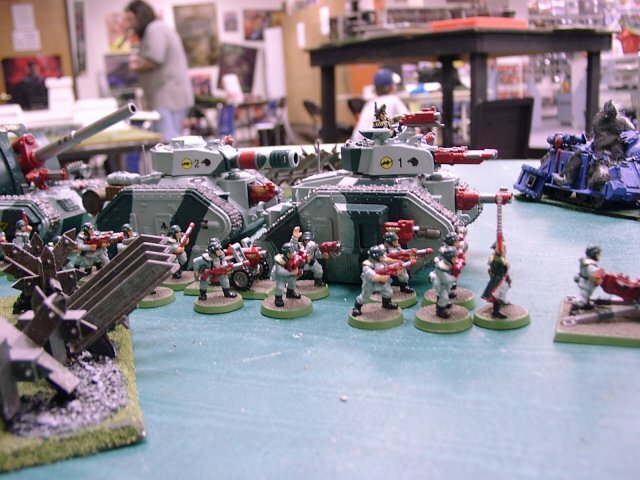 Before the game begins, the players agree how many points they may spend to purchase models from this collection to field as an army for the game. These are the commanders and famous heroes - "leader" type troops - the Space Marines have Commanders, Orks have the Warboss and his retinue of Nobz, and the Tyranids have the dreaded Hive Tyrant. Elites are usually seasoned troops, but may, in the case of the Tyranids, represent a different species of lifeform all together! 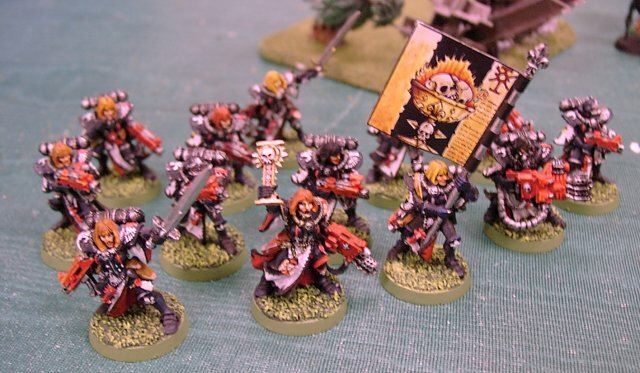 For the Space Marines, this includes the well-armed and armoured Terminators; for Eldar, Howling Banshees and Striking Scorpions, and the Battle Sisters have Celestian squads. Most scenarios require that an army consist of at least two units of troops. These are the grunts - the basic foot soldiers - such as Space Marines, Tyranid Genestealers, Ork Boyz, or Gretchin. Fast attack units sweep across the battlefield at breakneck speed. 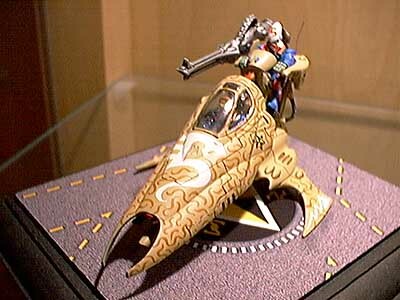 Typically, these units are composed of bikes, jetbikes, or skimmers, but may also include troops that can fly such as Tyranid Gargoyles or Space Marine assault squads. Heavy support units generally sport big guns to pound the enemy from a distance. 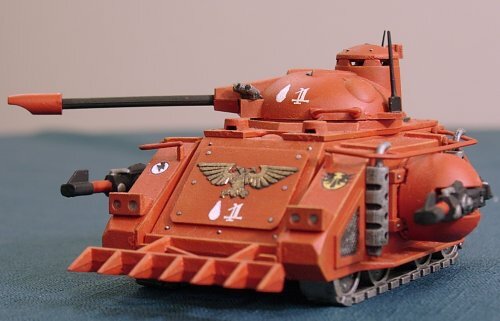 Tanks like the Space Marine Predator and Imperial Leman Russ are obvious choices, but Heavy Support also includes hulking brutes like the Tyranid Carnifex and the Chaos Space Marine Dreadnought. For most missions, a player is required to have at least one Headquarters unit and two units of Troops in his army. Sometimes, though, a special scenario may require an Elite, Fast Attack, or Heavy Support unit to meet the needs of an unusual situation. During the movement phase, models may move to get closer to (or, as discretion dictates, further away from) the enemy. Most troops move 6 inches, but vehicles and fast attack units can sacrifice shooting for movement. It's important to note that during movement, friendly models may not touch enemy models, as this would constitute an "Assault" (see below). Models with guns or other projectile weapons may shoot at the enemy. Some heavier weapons, such as missile launchers or laser cannons require that the unit stand still and aim during the Movement phase in order to fire. Most other weapons can be fired on the move, but some are substantially more effective (multiple shots, longer range) when the unit firing them is stationary. After the shooting phase, models that didn't stand still to blaze away with rapid-firing or heavy weapons may rush their opponents and engage them in an Assault. Such close combat is a dangerous affair where anything can happen - usually the loser is forced to retreat with the victor hot on his heels! Unlike the other two phases, both players participate in an Assault, as the models are assumed to be trading blows against each other in a swirling melee. Like innings in baseball, each player does all of the above in order, then hands the turn over to his opponent. Most games last for six turns. This is usually dictated by the mission. Some specify that the attacker goes before the defender, others vice-versa, and still others have the players roll dice to see who goes first. While it might seem obvious that the player who takes the first turn has a tremendous advantage (dead enemy models can't shoot back!) there is actually a subtle and very important art to going second. Again, like baseball, the team up to bat in the bottom of the last inning always has a chance to finish off their opponents before the game is over! What makes one model better/more powerful than another? 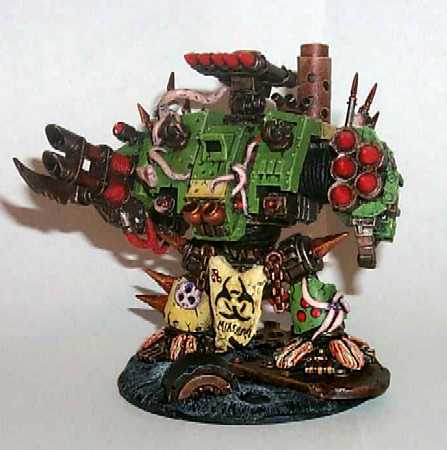 Each model is purchased from the player's points allowance according to its entry in the appropriate army list. This points cost reflects not only the model's personal statistics, but special abilities granted him by his equipment as well. Weapons Skill gauges how well the model fights in close combat. 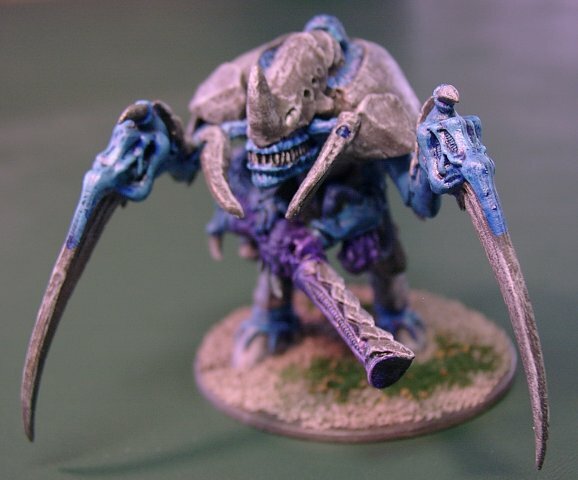 A human soldier has a 3, while the more ferocious Tyranids have a 4, 5, or 6. 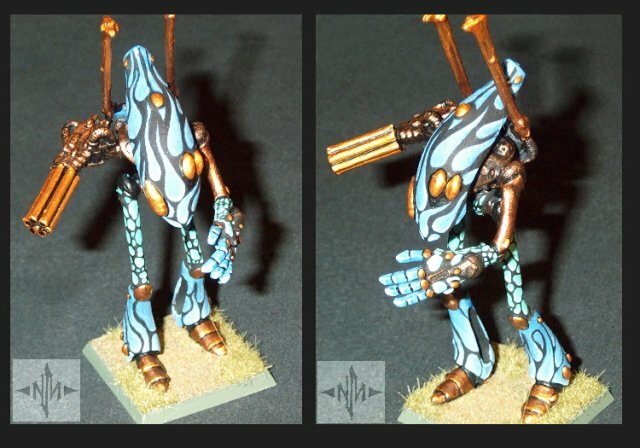 The Eldar Avatar, a manifestation of their god of war, has a WS of 10. Ballistic Skill rates how good the model is at shooting. A normal human soldier has a 3, while the highly-trained Space Marines have a 4 or even a 5. By subtracting a model's BS from 7, the player comes up with the number he must equal or exceed for his shooting "to-hit" rolls; i.e., a normal Space Marine with a BS of 4 must roll a (7-4) = 3 or better to hit when shooting. Models with a higher Strength are more likely to wound an opponent when a hit is scored during an Assault. A normal human has an S of 3. Space Marines, with their enhanced musculature and powered armour are stronger, and have a 4. 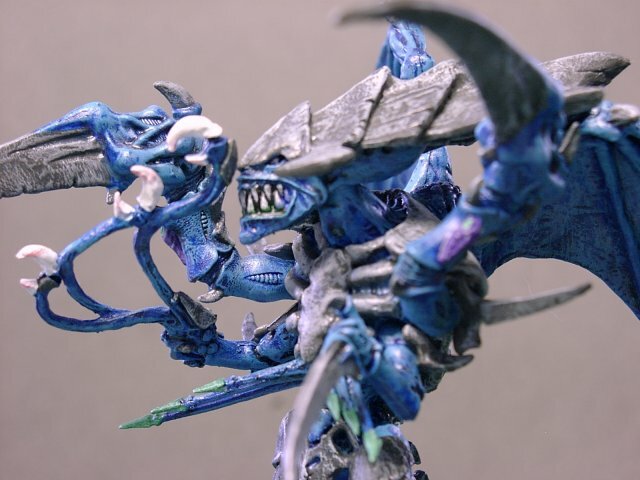 With its Strength of 10, the Tyranid Carnifex can knock down buildings and destroy tanks! Toughness indicates a model's ability to withstand an attack by sheer resilience. Models with a low T are easily wounded by small arms fire and blows in close combat, while models with a high T can even shrug off hits from heavy weapons. A normal human has an T of 3. The mighty Eldar Wraithlord - more of a construct than a living thing - has a nigh-invulnerable Toughness of 8. When a model's Wounds are reduced to 0, it is removed from the game. Most troops can sustain but a single Wound (either from shooting or close combat) before dying. Leaders and larger models	often have two or more wounds to represent their unusually heroic resilience, allowing them to carry on even when injured. Most troops have one Attack, allowing them a single opportunity to strike an opponent during an Assault. The more Attacks a model has, the more chances it has to hit in an Assault and thus the more ferocious it will be. Initiative measures a model's reflexes and awareness in combat. In an Assault, models with the highest I strike before their opponents have a chance to hit them back. A normal human has an I of 3. 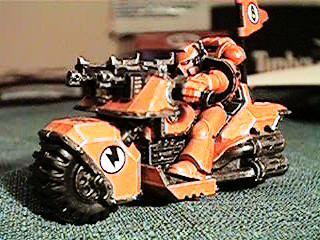 Space Marines are quicker and more alert, and have an I of 4 or 5. 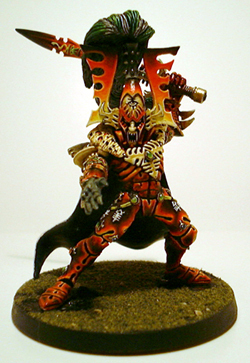 The lithe and graceful Eldar Phoenix Lords, who have honed their combat skills for thousands of years, have an I of 7! Leadership rates a model's bravery and psychic mastery. Models with a low Ld tend to run away when their unit sustains casualities, while models with a higher Ld will continue to fight even after suffering significant losses. Psykers with a higher Ld are also more likely to be able to summon enough warp energy to use their powers in battle. A normal human soldier has a Ld of 7. If the model's Sv is lower than the armour penetration of the weapon being used on him, then he can avoid being wounded by rolling equal to or higher than his Sv. Tyranid troops, with nothing but their tough outer shell might have a save of 6+ or 5+, while Space Marines have a 3+ for powered armour and 2+ for the virtually invincible Tactical Dreadnought ("Terminator") Armour. It might also be worth noting that some kinds of attacks ignore armour entirely, although most of these occur only during assaults. Some troops may have special equipment allowing them to make ranged attacks (usually, this equipment is a gun, but not always! ), or they may wear special armour or a force field that makes them "Invulnerable" (i.e., they may always roll their saving throw regardless of the attacking weapon). Sometimes, a model may also have close combat weapons such as a power fist that increase the strength of its hits during an Assault. As one might suspect, the higher the model's statistics are rated, and the more equipment it carries, the more points it's going to cost! 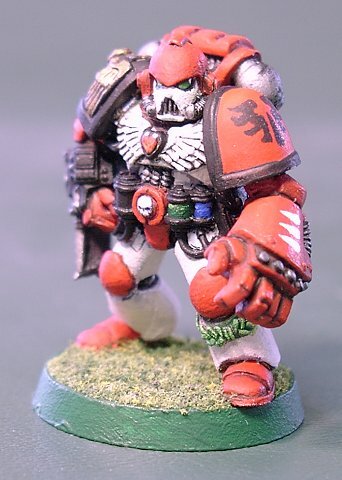 A normal Space Marine wearing powered armour and equipped with a bolt gun, for example, costs 15 points and is typically deployed in a squad of ten for a base cost of 150 points. Tough as they are, the Marines may find themselves outnumbered by the Tyranids or Orks, though, whose basic troops cost only half as as much! It's up to each individual player to gauge how to best compose his army to take on all comers. Should he spend the bulk of his points on foot troops and try to outnumber the foe, or cut back on the cannon fodder to include a few more powerful units that may carry the day? You can find more information on getting started with Warhammer 40000 at the Games Workshop website. Last updated 24 April 2007.